The two scholars I don't have, others are all max level The change in max skill level for some feeders from 5 to 10 is significant too. Alma!! Glad I didn't use Harpies on her! I just drew her yesterday and I can finally proceed to max slvl! Yay! In this case, the bottom half of the description is wrong - Kunlun Taoist and Starboard Keyboardist shouldn't work; they are for different attributes/skills (heart to enchanted fire, and dark to heart respectively). Why are they saying in the TOS FB group that Ao Guang's CD before PR can be trained? I don't see any cards with similar skill.. They are getting confused with the ducks. Treasure Raider, Martial Master and Tribal Chief are switch converters which can be skill levelled now. Ao Guang / Nezha / DBK are command converters. Perhaps a mod can help . I don't know what kind of toys the mods have in their arsenal , but perhaps they can copy the first post of this thread x2/x3 and then you edit it accordingly . If there is no copy post option perhaps they can merge an old post from another thread into this one ( if the post after the merge are sorted based on date it should be placed first . There may be other ways . Nice thread Arigato , hmmm medusa can be skill lvled with baby harpies ....i wonder how i missed that one and i was thinking of manually skill lvl grinding her . This helps a lot . The new updates on skill lvling are nice ( duck companion weekly battles thrash mobs - statues skill feeders ) it is going to save me some space from dupe cards i was keeping in case i decide to skill lvl them . Another set of cards that salamanders can feed for skill lvling .... why no love for witches and elves :p ? I don't need another thread right now as I have find an alternative to shorten the code. 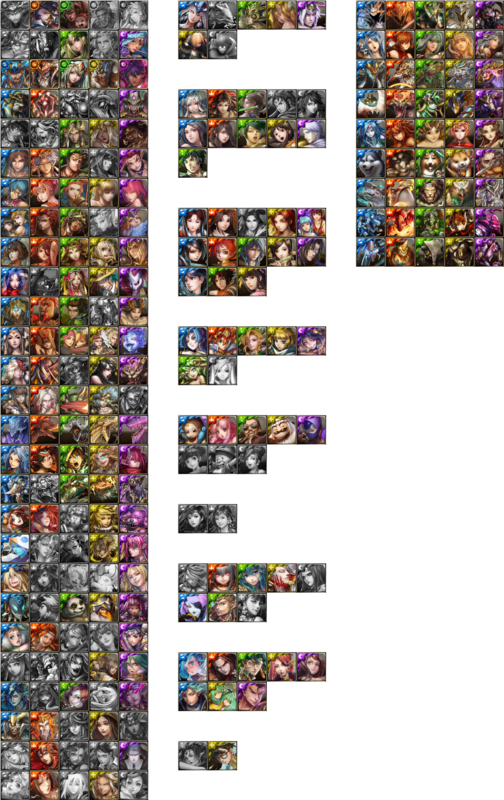 Instead of 1 image icon per monster which takes really a lot of space, I gather them as a group so i only have 1 picture per group. The one I posted right now is too small and I shall split them up and upload them after I go back to Singapore, it is troublesome to upload stuff in my hometown where both quota and speed is low. Witches and Elves are originally designed as EXP feeder, they gives much more EXP than other farmable mobs like wolf, salamander, gnome and slime. Gnome and slime have always been fight mode and defense mode feeder. Wolf is feeder for Baihu. Salamander is really useless before introduction of evolved pawn as skill feeder.